With that many words I love in the title of a recipe, there is no way you can go wrong with peanut butter and caramel pretzel crunch fudge. I really think Naomi might be trying to kill me. I feel like I have said that before! But death by caramel and peanut butter and chocolate and pretzels would be a lovely death. Add some crushed peanuts to the mix and you have the fudge version of my all time favorite candy bar, Take 5. 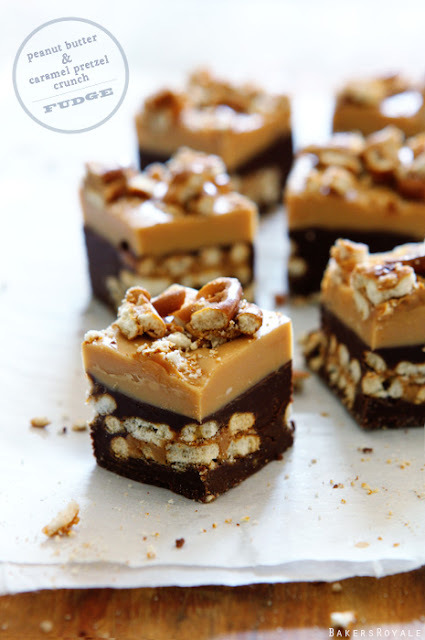 You can get the peanut butter and caramel pretzel crunch fudge recipe over at Bakers Royal. All my hubs favorites in one candy! Looks great!